MANILA - Typhoon Mangkhut has continued to intensify as it churns towards the Philippines, state weather bureau PAGASA said early Wednesday morning. In PAGASA's 5 a.m. bulletin, the typhoon is now packing maximum sustained winds of 200 kilometers per hour (kph), with gusts of up to 245 kph. A tropical cyclone with sustained top winds of 220 kph is classified as super typhoon by PAGASA. The U.S. Joint Typhoon Warning Center (JTWC) earlier said Mangkhut has intensified into a supertyphoon under its category of tropical cyclones, based on 1-minute instrumental readings. PAGASA has lower figures, because it uses 10-minute readings similar to the standard used by the Japan Meteorological Agency. PAGASA senior weather specialist Chris Perez said Mangkhut may enter the Philippine area of responsibility (PAR) on Wednesday morning and will be locally named Ompong. Moving west at a speed of 20 kph, the typhoon was last spotted at 1,390 kilometers east of Southern Luzon. 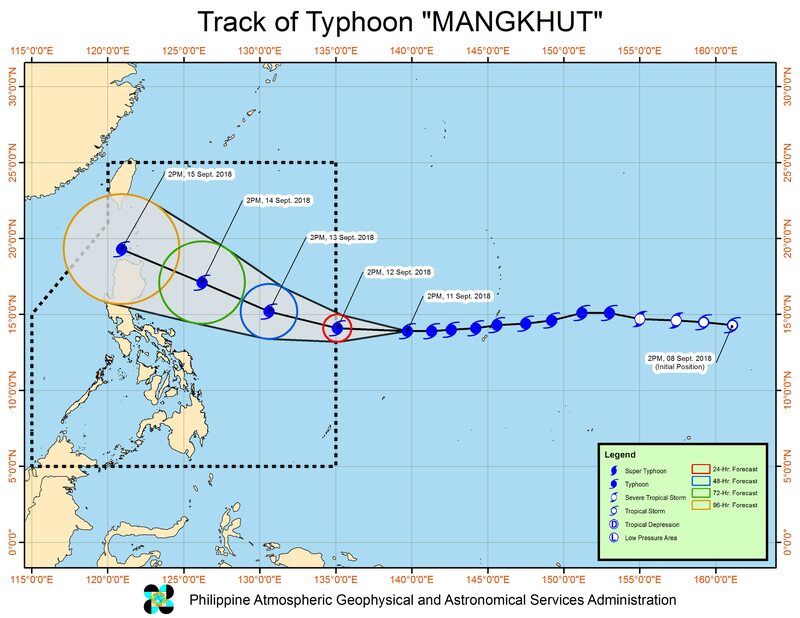 Mangkhut remains on track to threaten Northern Luzon and may traverse the Cagayan-Batanes area. "Subalit ilang bahagi rin ng Central Luzon at 'yung mga areas sa eastern section ng Southern Luzon ay posibleng maapektuhan ang lagay ng panahon," Perez said. Meanwhile, tropical depression Neneng has intensified into a tropical storm and now carries the international name Barijat. The storm, last located at 550 kilometers west of Basco, Batanes, will no longer have a direct effect in any part of the Philippines. Neneng has since left PAR and is moving towards Southern China.